NYC Grows at Union Square: A Delicious way to honor Earth Day. As part of Earth Month, Rouge Tomate will take part in NYC Grows at Union Square on Sunday, April 25th, a fun full day event showcasing healthy living, gardening, tree planting and of course sustainable cooking. Stop by the Farm to Fork Pavilion in the southwest quadrant of Union Square, where Rouge Tomate will greet you with samples, recipes and nutritional information from 10:00 am to 4:00pm. Jeremy and James will also each be conducting cooking demos on the main stage at 1:30PM and 3:30PM respectively. So come by and support your local restaurant, your local gardener, your local city, and your local taste buds. Because they taste like them, only a tad tarter, kiwifruit are commonly seen alongside strawberries in popular beverages and desserts. Think Kiwi-Strawberry Snapple or Ben & Jerry’s Strawberry Kiwi Swirl sorbet. If strawberry’s the man of the hour, kiwi is his loyal leading lady, often in tow and always attached at the hip, like strawberry’s best friend or lover. As most married couples know, however, even the most dynamic duos need some time apart. Although it works well as strawberry’s date, therefore, kiwifruit must sometimes break out on its own. And when it does, it’s absolutely delicious. Just ask New Zealanders. Although kiwifruit originated in China — and were originally known as Chinese gooseberries — they migrated to New Zealand in 1906 and have been one the country’s largest commercial crops ever since. In fact, New Zealand currently supplies 99 percent of the world’s kiwifruit crop. 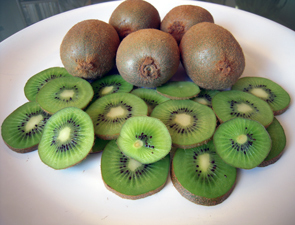 Here in the United States, most kiwifruit comes from California, which provides 95 percent of the U.S. kiwi crop. Harvests are typically in the fall (now is the perfect time for kiwifruit, actually) but because California and New Zealand are on opposite growing seasons, the small fruit — which is brown and fuzzy outside, and characteristically green inside — is available year round. It’s a good thing, too, because kiwifruit is versatile, flavorful and long lasting, keeping for up to six months in the fridge (store kiwifruit uncut at a 95 percent humidity level inside a plastic bag with a few small holes in it) or for up to a year in the freezer, so long as it’s peeled first and covered with a heavy sugar syrup. Because it tastes like a strawberry, but with a pineapple kick to it, kiwifruit can be eaten — alongside strawberries or instead of them — for breakfast or dessert, atop cereal, cake or ice cream, for instance, baked in a pie or blended in a smoothie. Because it’s highly acidic, kiwifruit works well in savory dishes, too, particularly when it’s used as a meat tenderizer in marinades. Try adding it to chicken salad for a tropical take on the traditional lunch, or serving it chopped with pears and jalapeños in a sort of salsa for fish. By far the best way to enjoy a kiwifruit, however: Eat it by itself — sorry, strawberry — by cutting it in half and scooping the flesh out with a spoon. It’s simple, sure, but it couldn’t be sweeter. For all of the bakers and chocolate enthusiasts out there, it’s very important to know what brands are best to work with when creating delicious desserts. As an avid baker, I’ve dealt with a number of varieties of baking chocolates over the years and have weeded out the brands that can be detrimental to even the best dessert designs. It is important that the chocolate you use for baking be creamy, smooth, and flavorful. Some brands have delicate undertones of flavors that can add a wonderful layer of complexity to any recipe. This Top Five Baking Chocolates list will, hopefully, help you decide which chocolate to include in your next dessert related endeavor. An excellent choice for budget bakers at about $8.75 for 17.5 ounces, this Belgian brand is sure to add richness to your desserts without breaking the bank. Callebaut’s dark chocolate balances bitterness and sweetness to create a complex, rich, almost earthy flavor with caramel undertones, making it a great choice to use in brownies. Unfortunately, Callebaut is not typically found in most supermarkets but can be purchased online or at gourmet shops and boutiques. At about $4.50 for 3 ounces, this San Francisco-based brand is a bit more expensive than Callebaut but is worth every penny. Splashed with a number of fruity undertones, cherry being the most prominent, Scharffen Berger is best used in cakes, particularly if you happen to be making a Black Forest cake or any other similar recipe that would benefit from the added complexity of this chocolate’s unique, natural flavors. This brand is becoming easier to find in supermarkets across the country but can always be purchased online, as well. Also based in California, this brand can be found in just about any neighborhood supermarket at the reasonable price of about $3.00 for 4 ounces. 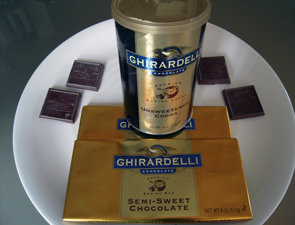 Ghirardelli’s products can be described as ‘intensely chocolatey’ which sounds redundant unless you’ve actually tasted some of their chocolate or even something made using this premium product. It has a uniquely assertive flavor that will assure any taster that they are eating pure chocolate. Approximately $4.00 for 2.6 ounces, this is one of the pricier chocolates on this list but, like all of them, is worth every penny. Based in France, Valrhona produces the Manjari bar, my recommendation, a chocolate that is rich, balanced, creamy, and deep, with fruity and lightly floral undertones. The embodiment of all we search for in chocolate, use this bar in any recipe with the word ‘bliss’ in the title. This brand will most likely be found in gourmet stores. In the past year or so, this Oregon based company developed a small line of organic baking chocolate products that can be purchased for about $7.00 for 6 ounces. While these products are excellent in quality and flavor and will certainly add richness to any recipe, you may want to take at their original product line of chocolate bars meant to be eaten ‘raw.’ They have a selection of ’standard’ types, sweet, semi-sweet, bittersweet, but the true gems are the artisan bars like lavender blueberry, lemon ginger, chai, and the ‘roseberry’ bar, made from raspberries and rosehips. At about $3.50 for 2 ounces, including Dagoba in your next dessert might be a bit costly, but the effect on your desserts is entirely worthwhile. Much like the philosophy that states ‘One should never cook with wine they wouldn’t drink,’ you should never, ever bake with chocolate you wouldn’t eat. Whatever your preferences or expectations are, these brands will meet, if not exceed, them. Whether you like it in wedges or in rings, crushed or in chunks, you have to agree: Pineapple is a sweet, sweet fruit. Neither a pine nor an apple, a single pineapple is actually the fruits of a hundred or more separate flowers that grow on a pineapple plant in the center of a single spike, surrounded by sharp, sword-like leaves. As they grow, the small fruits bloat with juice and expand into one another, becoming a single pineapple that typically weighs between four and nine pounds, but can reach up to 20 pounds. Although interesting, pineapples aren’t known for the plants they grown on. They are, however, known for their distinct appearance. In fact, given the way pineapples look — covered with sharp quills and topped with spiky leaves — it’s a wonder that someone decided to try eating them at all. Luckily, someone did. And contrary to popular belief, it wasn’t a Hawaiian, as pineapples aren’t actually native to the islands, although they’re now grown there en masse — they’re Hawaii’s largest crop and industry — at the famous Dole Pineapple Plantation, which gives daily tours of its pineapple crops via its train, the Pineapple Express. 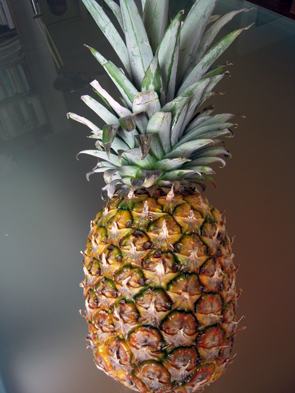 Instead, pineapples are thought to have originated in Brazil or Paraguay. Christopher Columbus discovered them in 1493 in the Caribbean, where they were a favorite of natives who’d brought them there from South America, and then promptly took them back with him to Europe. There, they quickly became a favorite table decoration and dessert for royals like King Louis XIV of France, who famously cut himself on his first pineapple when he ignorantly bit into it without first peeling it. It’s because they’re simultaneously so sweet and so sharp — in the West Indies, Indians used them as a sign of “sweet” hospitality and also as “sharp” and spiky barriers designed to keep out intruders — that pineapples are so revered. And — for some people, at least — so feared. If you want to cash in your canned pineapple for the fresh stuff, however, there’s no reason to be afraid. Pineapple’s in season year-round and won’t ripe further after it’s picked, so it’s easy to find one that’s fresh. Just look for fruit with green, easy-to-pluck leaves; small, compact crowns; a strong, sweet, but not fermented pineapple aroma; and a slightly soft bottom that yields to medium pressure. To get into a pineapple once you’ve brought it home, use a sharp, serrated knife to cut off the base and the crown, and, using a downward vertical motion, the skin all around it. Once it’s skinned, cut around the core of the fruit, which is tough and fibrous. Use the fruit, which you can refrigerate for five to seven days, within the week. It’s good on its own, with desserts or as an accompaniment to chicken and pork — especially in sweet and sour dishes! The ‘Big Melon’ - That Isn’t a Melon At All! For most people, “papaya” is a just another ingredient in their shampoo, or the scent of their air freshener. For fruit-loving foodies, however, papaya is so much more. If you’ve never actually seen a papaya fruit, it looks like a large melon. In fact, “big melon” is what it’s often called, although it’s not actually a melon at all. Either spherical or pear-shaped and sometimes up to 20 inches long, papayas - called “pawpaws” in the West Indies - are actually the fruit of a large, tree-like herb. And like most herbs, papayas have some truly powerful medicinal qualities to them, thanks to an abundance of antioxidants such as carotenes, vitamin C and flavonoids; minerals such as potassium and magnesium; and fiber. 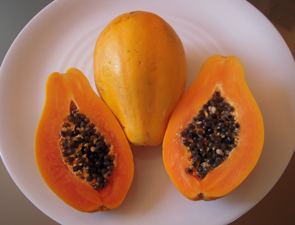 The star ingredient in papaya, however, is a digestive enzyme known as papain, which has been used to promote digestive health, treat sports injuries and alleviate allergy symptoms. Of course, most people don’t eat papaya for digestion. They eat it because it’s delicious. It’s so delicious, in fact, that Christopher Columbus called it the “fruit of the angels” when he first tasted it in the New World. Never tasted one? Think of a sweet yet somewhat musky tasting cross between a cantaloupe, a peach and a pineapple. That’s how the flesh tastes. The seeds, on the other hand - which are also edible - taste peppery and somewhat bitter. Papayas are delicious for your eyes, too. They’re green or yellow outside and a rich shade of orange inside, with shades of pink and yellow, too. The most visually interesting parts of the fruit, however, are the round black seeds, which are encased in a gooey, gelatinous substance. The pear-shaped papayas in U.S. markets are usually about 7 inches long and weigh about one pound, although you may encounter some Mexican papayas that are much larger and more spherical in shape. Available year-round, properly ripened papaya is more yellow - or orange, even - than green and should feel soft when you squeeze it, like a ripe avocado. Although the skin is edible, most people prefer to scoop the pulp out of the papaya shell like they would an avocado. The fruit can be eaten raw or boiled and eaten like a vegetable. For dessert, try it in homemade ice cream or sorbet, or as a substitution in any recipe that calls for mango. A note of caution: If you have a latex allergy, avoid papayas, which often release a latex fluid if they’re picked before they’re ripe. Strawberries. Apples. Bananas. Americans’ favorite fruits are fine in a pie, in a fruit salad or atop your morning cereal. If you’re like most people, though, you occasionally crave a more fantastic fruit. Something a little bit different. A little more exotic. But not too different. When you do, the mango is the perfect snack. Native to southeast Asia - where they’re are as everyday as apples and oranges are in the United States - mangos are a fruit that’s at once familiar and foreign to the average American, who’s likely to have tasted a mango but never actually bought one. If that describes you, you’re missing out. Although mangos are grown in limited supply in California, Florida and Hawaii, the United States gets most of its mangos from Mexico, Puerto Rico and Central and South America, including Peru, Ecuador, Brazil, Guatemala and Haiti. Just as diverse as the countries that export them are the mangos themselves, which can be yellow, orange, red, green or any combination thereof, and either soft and pulpy or firm and fibrous, depending on the variety. 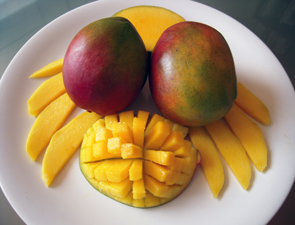 No matter the size, color or texture, however, all mangos have at least one thing in common: their unique and delicious fruity flavor, which lends itself equally to sweet and savory dishes. You can snack on mangos raw, for instance, atop ice cream for dessert, or serve them diced in a salsa or chutney with meat or fish for your main course. No matter how you eat them, you’ll be eating something that’s both nutritious - mangos are especially high in fiber and vitamin C - and interesting, as mangos have a long and storied history. Known as “the king of fruit,” they grow on tall evergreen trees that are considered sacred in India, where some believe mango trees can grant wishes (Buddha himself was said to have meditated beneath a mango tree) and where Hindus use mango twigs to brush their teeth on holy days and mango leaves to celebrate childbirth. Of course, you don’t have to hold mangos sacred to enjoy them. You just have to be adventurous enough to pick one up at the supermarket. When you do, look for mangos that are slightly soft to the touch - like a ripe peach - and that emit a full, fruity aroma from the stem end of the fruit. When you get it home, cut a “cheek” from each side of the fruit, leaving behind one slice - the inedible core - from the middle. Score the fruit inside each cheek, being careful not to cut through the skin, then turn the whole mango half inside-out in order to reveal a series of mango cubes that you can slice off the skin with a knife. Although it sounds like a lot of work compared to eating an apple, the sweet snack - familiar, yet foreign - is well worth the extra effort. Here’s something to chew on: Did you know that the world’s fattiest fruit is also one of its healthiest? Well, it is. And no, we’re not talking about French fries, although we wish they counted as a fruit. We’re talking about avocados. Known as the “fat” fruit, avocados contain nearly 15 grams of fat apiece, which is more than a small fry at McDonald’s, which has 11 grams of fat. The difference between the fries and the fruit, however, is that the most of the fruit’s fat is heart-healthy monounsaturated fat, which has been shown to assist in weight loss, and to lower bad LDL cholesterol while increasing good HDL cholesterol. So while the fries are likely to grow your waistline, the fruit may actually help you shrink it. Fat isn’t all avocados have to offer, however. They’ve also got plenty of potassium, which can help regulate blood pressure; lots of folate, another heart-healthy nutrient; and more fiber than any other fruit you’ll find at the market. And in case you’re more concerned about flavor than you are about fiber, avocados have plenty of that, too. Known for their creamy texture, avocados aren’t sweet like other fruits. Instead, they’re savory. Although they’re most commonly used as a base for guacamole, they’re also a great addition to salads and sandwiches. In Texas, for instance, peanut butter and avocado sandwiches are popular, thanks to the region’s Mexican influence. Sound strange? 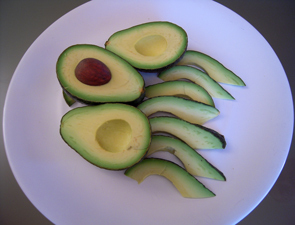 Start simpler and try avocado on a burger, in a taco or in an omelet. Another thing avocados have plenty of is history. Native to Mexico, as well as parts of Central and South America, they were popular first among the Aztecs, who used them as a sexual stimulant and even named them “ahuacati” for the Aztec word meaning “testicle.” If it sounds a little racy, that’s because it was. Known as the “fertility fruit,” the avocado historically was avoided by anyone who wanted to maintain a “chaste” reputation. Eventually, though, avocados caught on. When they did, they were transplanted to Asia, Jamaica — where they were colloquially called “alligator pears” because of their pear shape and dark, leathery skin — and the United States, where they’re now grown commercially in Florida and California. While many consider California the “avocado capital of the world,” you can easily turn your own home into an avocado garden — provided you have a lot of sunlight, and a lot of patience to match. To grow your own avocado tree, simply remove the pit from a fresh avocado and clean it, then push three toothpicks into the pit so that you can suspend it over a glass of water; the toothpicks should rest on the rim of the glass while the base of the pit is submerged in water. When you put the glass in a bright windowsill for several weeks, the pit will split and sprout a stem that can be transplanted to a large flowerpot when it’s approximately six inches tall. At that time, keep the bottom half of the pit in soil and the top half exposed — just like you did in the glass of water. After three or four years, your tree may begin to grow fruit, especially if you have several trees, which aids in pollination. While avocado trees can grow up to between 20 feet and 40 feet tall, don’t worry: If you prune it, you can keep yours short enough to fit in your living room all year round — to the benefit of both your tortilla chips and your heart! When you eat figs, you’re eating more than fruit. You’re eating a very sweet piece of history, as fig trees are thought to be among the first plants domesticated by man. In fact, archaeologists have discovered fig fossils in the Middle East that date all the way back to 9400 BC. That was roughly the same time that rice was being domesticated in Asia, but at least 5,000 years before man began farming wheat. Although people have been eating them for more than 11,000 years — even longer, according to some Bible scholars, who believe that Eve’s “forbidden fruit” was actually a fig instead of an apple — figs are hard to get tired of. So sweet that historically they were used instead of sugar as sweeteners, they’re just as versatile as they are old. They can be eaten fresh or dried, for instance, turned into jam, paired wonderfully with savory cheeses, breads and olives, or baked with nuts into sweet cakes, pies, tarts and pudding. They make fantastic cookies, too. Just ask Nabisco, which makes everyone’s favorite form of fig: the Fig Newton, which was named for the town of Newton, Mass., near the original Fig Newton factory. Although they taste wonderful, fresh figs are hard to come by because they will not ripen off the tree and can therefore be picked only when they’re at their prime. 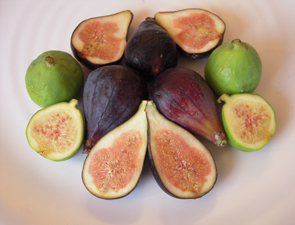 Because they go bad quickly once they’re picked — they’ll only keep for two or three days in the refrigerator — fresh figs are typically only available from June until October near the farms where they’re harvested, most of which are located in the Middle East, the Mediterranean or, in the United States, California. Dried figs, on the other hand, are readily available and can be stored for up to a month at room temperature, or for as long as a year in the refrigerator. Figs aren’t just delicious. They’re also interesting. Did you know, for example, that there are hundreds of different fig varieties, and that the fig is actually the fig tree’s flower, not its fruit? Did you know that fig tree sap is an irritant to human skin? Or that fig trees won’t grow unless a special insect, called a fig wasp, pollinates them? Whether you’re a chef, a scientist or a historian, it’s fascinating stuff, and figs are fascinating food. In the United States, we like to say things are “as American as apple pie.” Really, though, we should consider saying they’re as American as strawberry shortcake, instead. Because while China out-produces the United States in apples by approximately 2.3 billion metric tons every year, the United States without doubt is the world’s top producer of strawberries, growing over 1 million metric tons of them every year. Never are foodies so glad about that as summer time, when America’s strawberry crop is at its peak. On pound cake with a dollop of whipped cream, fresh strawberries, they know, are the perfect summer dessert. Just ask the residents of Plant City, Fla.; Oxnard, Calif.; or Troy, Ohio. They’re but three cities of many in the United States and across the world that hold strawberry festivals every year in order to celebrate the bulbous, bright red berry. Held just last month, the California Strawberry Festival in Oxnard, for instance, featured a strawberry recipe contest, strawberry crafts, a strawberry planting workshop and more than 50 strawberry food booths offering everything from strawberry pizza and strawberry nachos to strawberry beer and strawberry wine. With all the hoopla, you’d think strawberries were a new and exciting discovery. While they’re certainly exciting, sure, they’re definitely not new. 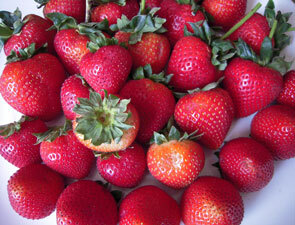 In fact, strawberries were first cultivated commercially in the early 17th century, more than 300 years ago. Since then, their history has spanned the globe. While they were popular early on in Europe, in South America they were considered poisonous until the mid-19th century. In the United States, meanwhile, they were long considered a medicinal fruit, used by Native Americans to treat colds and by Minutemen during the Revolutionary War to treat scurvy. If you haven’t already this season, it’s therefore time to give strawberries your own nod - at breakfast, perhaps, on top of your cereal, or at cocktail time, blended with rum into the perfect daiquiri. 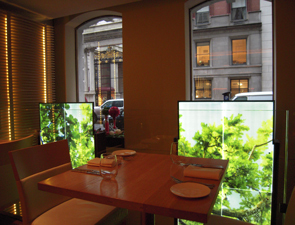 Have a taste for something more ambitious and sophisticated? Consider making your own strawberry jam served on homemade biscuits, or a homemade crème anglaise, served over fresh strawberries and nuts. Or, of course, there’s always the old standby: strawberry shortcake. Move over, apple pie. 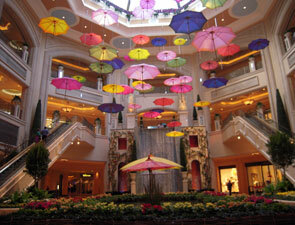 Read about Mario Batali’s One Day Only Farmer’s Market at the Palazzo 6/3/09!